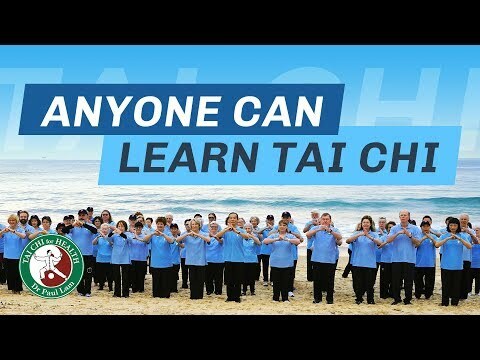 To improve your tai chi, it is essential to practice regularly, understand the tai chi principles and incorporating them into your practice. There are many ways to improve your level of tai chi, like climbing up a mountain, some ways are easier and more enjoyable. The four “directions” can help you understand the principles better and get to the more beautiful part of the mountain more quickly. These are jing 静, song 松, chen 沉, and huo 活. The four directions complement each other, so you don’t need to be completely proficient in one before moving on to another. They also affect each other positively, so that by progressing at one you will improve all others. Try working on one direction for a period of at least two weeks before moving on to another. Do keep coming back to visit all of them regularly. Jing means “mental quietness or serenity”. Think of the quietness in your mind; think of quietness from within. Imagine yourself in a quiet environment such as a tranquil rainforest. If you do this regularly, you’ll soon become quiet from within and be able to focus on what your body is doing. Another way to reach jing is to be more mindful or to be at the moment; or to inhabit your body. allows you to focus better. This, in turn, enhances balance and relieves muscle tension, most importantly it creates a space for your qi (life energy) to circulate and develop. The mental quietness of tai chi is different from some other forms of meditation. While you are serene from within, you are still aware of your environment and able to assess the situation around you at any time – being mindful of the environment as well. A more jing state will help you deal with any crisis in real life more effectively. At time of need, saying the word jing quietly to yourself may help bringing you to that state. Song is often translated as “relaxation”, but it means more than that in Chinese, conveying a sense of loosening and stretching out of the joints. Imagine all your joints opening, loosening, or stretching out gently from within. Take your shoulder joint, for example. If you gently stretch out that joint, you’ll feel a small dimple on the top of the shoulder. If you tense the shoulder joint, the dimple disappears. your elbows, wrists and finger joints by stretching them out in the opposite direction, almost like gently pulling the joint open. In the spine, the loosening should be vertical – visualize your spine as a string that you gently stretch from both ends. For the lower limbs, stretch your hip joints and knee joints gently outwards, so that your crouch forms an arch. This method of loosening constitutes a type of controlled relaxation, because when you gently stretch your joints, you’re attaining song, and you can’t be tense. Song helps your qi flow powerfully through the joints, builds internal strength and also improves flexibility. It will also enhance jing. When your joints are song, your mind becomes more jing, and as your mind becomes more jing, it in turns further song your joints, thus setting up a positive circle. Chen (not the same word in Chinese as the name of the style) means “sinking”. As you progress in tai chi, you’ll come across the term “sinking your qi to the dan tian.” Dan Tian is an area three-finger width below the belly button. The dan tian is central to everything we do in tai chi as it is the storage house of qi. feel a warm and heavy feeling in your dan tian. That’s the feeling of sinking your qi. If you don’t feel this initially, that is usual, continue to practise the form incorporating tai chi principles. As you improve, you’ll eventually feel the qi in the dan tian and learn how to sink it. Chen greatly enhances stability and improve balance. It also facilites song and qi cultivation. Awareness of the dan tian will strengthen the internal structures of your body, and improve coordination, and strengthen your spine. a good mental state are essential, and these attributes will be even more effective with better agility. Agility comes from regular practice with the proper body posture, weight transference, control of movements, loosened joints, and strong internal strength. Agility aids qi cultivation and improves flexibility.